If you want to stand out from your competitors and break through the content clutter, then you need to create a strong and unique brand. There are billions of people on earth – but there is only ONE of you. There may be similar people to you, but you are unique. And that’s why using yourself as your brand is an effective strategy. People remember people more than they remember products. The most effective way to use yourself as your personal brand, is to get in front of your video camera and establish rapport with your audience. However you must understand that your viewers will judge your business based on your performance. So if they see that you are lacking in confidence, unprepared and confused, then that will have a negative impact on how they will view your business. If however, you can present yourself with confidence, and engage your audience, they will feel the same way towards your business. In fact, your performance on the video is more important than what you actually say. 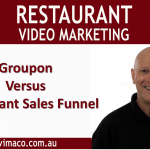 So learning how to present yourself on video should be one of the key elements in your video marketing strategy. Now let’s look at the number one presentation tip that you will find everywhere. It’s a tip that I believe is not entirely what it seems. We constantly hear the word – “authenticity”. “We must be authentic in our videos:. But what does that really mean? Simply put, being authentic means staying true to who you are, being genuine, honest and transparent. So if being authentic is being who you are, the question is who are you really? Let me explain. Every day, we play different roles. I myself play the role of a partner to my wife, a father to my two children, and sometimes when we are playing, I also play the role of their friend. I am leader in my business, I am a teacher and I am a student. All of these roles are different and yet they are all parts of me, and they are all authentic. And so when we present ourselves on video, we need to play the role of the “Presenter”. This role still part of you – but only the part that you need to do this particular task. For example, I am an introvert – that is I generally prefer to listen and internalise my thoughts whereas an extrovert speaks and externalises their thoughts. However in a situation like presenting in front of a video camera, internalising thoughts makes no sense, so I need to find the “presenter” within myself – the one I used for my acting on television, to perform the task. We all have the “presenter” within us and it’s job to find it, nurture it and polish it. Let’s look at the qualities that we admire most in presenters. Great presenters are very likable. They are people we would like to meet and spend some time with. They are charming, they have personality, they have energy, they are focused, they are spontaneous, they are natural. You might say that they have charisma. All of those things are the result of just ONE trait – Confidence. You see when people are confident, they are relaxed and their whole body language opens up. They smile and seem to be enjoying themselves. This is very important because audience members tend to mirror the emotions of the presenter. When we watch a presenter that is nervous and anxious, we start feeling their emotions ourselves. It is not an pleasurable experience. However when we watch a confident speaker who is enjoying themselves, then we are drawn to them like moths to a candle. Ok, we know you need to be confident in front of the camera, but what about the nerves – especially if you are doing a LIVE webinar? You need to “reframe” your nerves. Nerves are good. In fact you need those nerves to deliver a powerful performance. Nerves are the result of the “fight or flight” response that says this is important and your body is preparing you to perform at your best. So let’s change the word “nerves” and replace it with “excitement”. You now feel excited instead of nervous. I remember performing many opening nights on stage when the entire cast would feel “excited” and even if the show experienced some hiccups, the sheer energy of the performers carried it through. It was the 2nd night syndrome that was the problem when the adrenaline wasn’t there and the performances were flat. So when you start to feel the “excitement” in your tummy, smile and be thankful that you will deliver a performance with energy and focus. Just concentrate on deep slow breathing which will help slow down the heart rate and give you the control. Some speakers feel confident in front of a live audience but feel stiff in front of an inanimate camera. The trick is to look straight down the lens and imagine having a conversation with your best friend. Remember that you are not performing in front of a large audience but speaking one-to-one with a viewer watching you on their screen. So slow down your presentation, pause, let for information sink in, and use a conversation tone. So how do we become confident? Just do these three things – practice, practice and practice. You know the old saying – “he or she who fails to prepare is preparing for failure.” Do your homework and know what you are talking about and you will instantly feel more confident. I always like to practice my presentation in front of a mirror, making eye contact with myself. Why? Because it give you instant feedback. You can see yourself , your body language, your facial expressions and make the adjustments as you go. Some presenters think that by practicing too much, they will lose their spontaneity, but they are wrong. In fact, it is quite the opposite. As actors rehearse scenes while learning their lines, they are somewhat disconnected as they try to remember their words. However once they become word perfect, they can totally focus in the present moment, be in the zone, and that’s when the magic happens and the spontaneity comes through. That’s when you reveal and share a part of you that truly connects with your audience. I have had the website fully optimized recently so everything should be working fine. Let me know if you still have a problem. Thanks for some other magnificent article. Where else could anybody get that type of information in such a perfect manner of writing? I’m still learning from you, while I’m trying to reach my goals. I definitely liked reading all that is written on your website.Keep the aarticles coming. I enjoyed it!